Continuing the Ag Innovation Showcase tradition of showcasing innovations with both commercial potential and positive environmental impact, we announce 11 North American presenters. Three additional companies from Asia and South America will be introduced soon, in a separate announcement. Beginning on the “left” side of the food value system , at the “farm”, three companies will present innovative technologies addressing Genome modification and discovery. Plastomics (located in Missouri) is developing a new and better way to make the next generation of biotech crops using chloroplast engineering. This technology platform provides solutions to current industry challenges: efficient trait stacking, decreased time and cost to market, more effective trait dose, elimination of outcrossing to weeds or neighboring fields, simplified breeding and higher yields. The founders are pioneers of the technology and the team has >150 years experience in Ag Biotech. Using Plastomics’ technology, seed and trait discovery companies can make better crops and deliver them faster to market, helping farmers feed the world. Two of this year’s presenters are harnessing the genetic diversity of beneficial microbes. 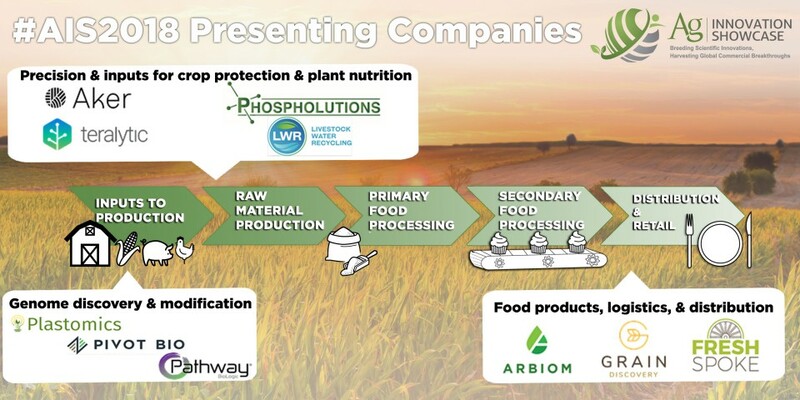 Pathway BioLogic (located in Florida) brings partners a platform to discover, ferment and formulate a range of microbes to combine with existing products for targeted crop and animal benefits. Pathway couples their novel fitness based inoculants platform (FBI) with their proprietary microbial integrated technologies platform (MIT). Pathways microbes can be incorporated into a range of existing products whether traditional chemistries or organic, thereby unleashing the full potential these combinations represent. Their technologies improve shelf life, compatibility, stability, and use, in addition to improving crop and animal performance. A second leader in the field of precision microbial adaptation, Pivot Bio (located in California), has developed a sustainable, natural nitrogen source for farmers: nitrogen-producing microbes. Nitrogen is the key to productive farmland, but most of the synthetic nitrogen fertilizer applied to row crops ends up in our air and our water instead of our plants. Nitrogen producing microbes grow with the plant, spoon-feeding the crop daily nitrogen at its roots. With the first eco-friendly crop nutrition product available to farmers for 2019 planting, Pivot Bio aims to reinvent the fertilizer industry and dramatically reduce air and water pollution. Continuing beyond genomes, a group of companies will present innovation in the block addressing Precision and inputs for crop protection and plant nutrition. The first company in this block, Aker (located in Illinois) addresses the need for precision in crop protection. Farmers lose millions of dollars to crop disease. Agronomists and farmers don’t have the resources to observe pests and take advantage of new in-season products to limit yield loss. The Aker Pest Network is a global pest and pathogen information network. Aker has patented technology that automates ‘crop scouting’ or observation INSIDE the canopy of crops. Aker provides geo-referenced real observed data and crop diagnostic tools, not inferred or approximated by current crop models. Top brands such as BASF, Bayer, Wilbur Ellis and Winfield-UNITED rely on Aker’s service to increase grower trust and provide for more precise in-season inputs. Livestock Water Recycling (located in Alberta, Canada) creates value for crop and animal farm operations by reducing the expense and impact of waste liquids and producing nutrients from waste. Their recently re-launched LWR2 System is a proven, patented, commercialized nutrient recovery platform. Now equipped with data accumulation sensors for a subscription-based analytics program, this system reduces the volume of manure and bioliquids, concentrates nutrients into valuable crop fertilizers, and delivers a renewable, high-quality clean water source. At the height of the farm-to-table social movement, consumers are demanding transparency. LWR’s technology is designed to achieve optimized production, maximum crop yields, and a high return on investment while minimizing the environmental impact of food production. Phospholutions (located in Pennsylvania) is a second company that produces nutrient inputs via recycling and recovery processes. Their technology is dedicated to reducing the environmental impact of fertilizer, by removing phosphorus from various sources of pollution to generate a controlled-release fertilizer. Another important area for input innovations is the area of detection and analytics. Teralytic (located in New York) is a soil analytics company that makes it easy for farmers to grow more using less, while reducing the environmental impact of agriculture. Teralytic’s wireless probe contains twenty-six sensors to provide the most detailed soil quality data available, reporting soil moisture, salinity, and NPK at three different depths, as well as aeration, respiration, air temperature, light, and humidity. With no wires, no antennas, and an easy set-up, Teralytic provides customized recommendations and sends real-time alerts to farmers’ phones and desktop devices. Moving to the right side of the food value system, closer to the “plate”, this year’s Ag Innovation Showcase will also feature companies with innovations in Food products, logistics, and distribution. Arbiom (located in North Carolina) is developing technology that transforms a readily available, renewable and non-food carbon source – wood – into a natural, economical, traceable, and sustainable source of protein. Arbiom’s technology integrates pre-treatment, hydrolysis and fermentation processes in a flexible platform to produce single-cell protein, and other products. Arbiom technology reduces the resources required to produce protein and it reduces the environmental impact of animal protein production, thus helping to meet the sharp increase in global protein requirements. Usarium, dba Plantetarians, (located in California) has a patent-pending technology to add value to overlooked ingredients like defatted seeds, converting them into a high-protein, high-fiber ingredient, and helps food manufacturers fortify a variety of food products with natural protein and fiber from seeds. The ingredients are available in flour and crisps-like form with 35% plant-based protein, 18% fiber, and 1% fat. They are allergen free and non-GMO, unlike soy-based proteins. They are 5x cheaper than pea protein and are a good source of fiber. They have two times more protein than beer spent-grain flour. Replacing 30% of All-purpose flour with defatted seeds doubles the protein and fiber content, keeping costs the same. FreshSpoke (located in Ontario, Canada) makes local food more accessible by providing wholesale buyers with the ability to source directly from local food suppliers and delivering to the door using the excess capacity that already exists in the commercial delivery system, solving the big distribution problem without adding more trucks or warehousing. FreshSpoke’s web and mobile apps now connect over 180 farmers/growers, and food and beverage artisans with 300+ foodservice and retail buyers in Ontario, Canada, and the US Midwest. Grain Discovery (located in Ontario, Canada) addresses the pain points of the global commodity supply chain – loss of provenance, opaque markets, and connectivity. We are an online exchange that leverages the latest blockchain technology to create an efficient, transparent and secure market that simplifies and enhances the connection between farmers and buyers.